The Ultimate Act! <-> Outlook/Exchange Synchronization! Never has such a complete and powerful tool been available to maintain your Act! data in Outlook/Exchange. Compatible with Act! 2007 through 2014 and ALL versions of Outlook (32-bit) and Exchange. 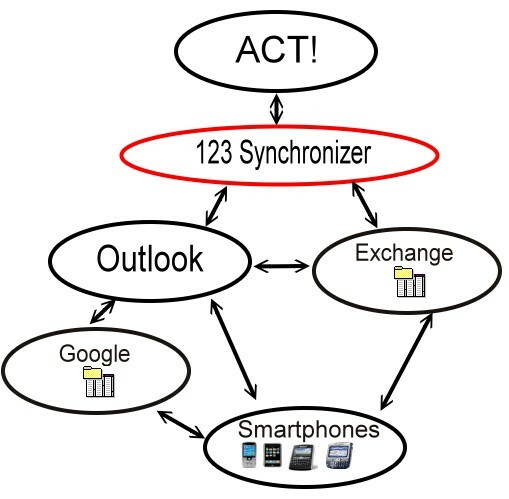 The purpose of 123 Sync for Act! and Outlook/Exchange is to provide users with a tool to quickly convert, synchronize, update, and transfer an Act! Contact database into multiple individual or shared Outlook/Exchange Folders. Enhanced filtering system and options allow you to slice which segments of the Act! database that you want to bring over to Outlook/Exchange.